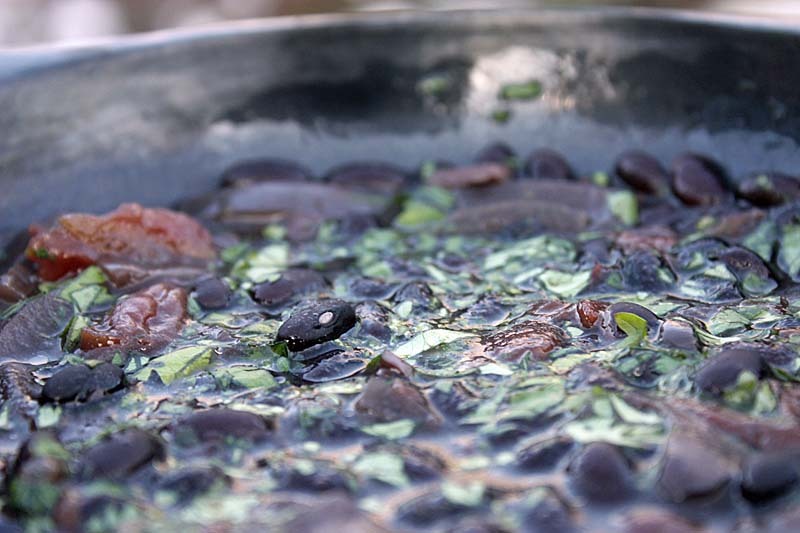 Not that you can tell, but this bowl of Smoky Black beans was photographed on Sunday, outside the ice rink in my garden, otherwise known as my garden plot covered in snow. I've made a deeply intense Black Bean Chilli before, but this one is very different in character. Its sauce is thin, yet it has heat and smoky overtones from the dried chipotle chillies. 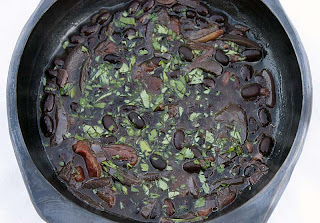 So far, we’ve had this Smoky black beans three times this week. Ladled over plain Basmati rice, over jacket potatoes and with some home-made (bread machine) crusty bread. We still have plenty to feed us at least another two meals, if not three. I could have easily halved the quantity but with more snow predicted I knew it was going to be a hectic week at work, and that’s just the travelling to and fro. Its not the only dish I’ve made, I’ve also made some Quinoa cabbage rolls but that still sitting pretty in the fridge waiting to have a blast in the oven. I was actually going to mince all the chipotle peppers, but D tasted a spoonful and said. Oooh I think that is smoky enough. I ended up fishing out the other two. After softening the onion and garlic in oil, I actually added all the ingredients to the slow cooker aka crock pot, but if you don’t have one these can easily be made on the stove too (see recipe below). Whilst taking the photograph of the Smoky Black beans in the garden, D captured this little fella feasting on an apple in the tree. I know the apples are not perfect, but s/he doesn't seem to mind. Soak the beans overnight. The following day, drain and rinse them well. In a frying pan, heat heat the oil, then add the onion and garlic and cook and soft. 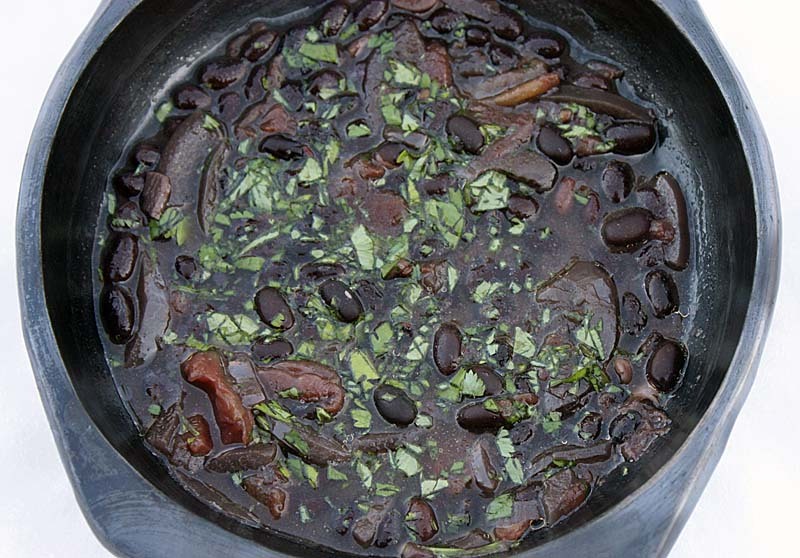 Add to a large pot, along with black beans, tinned tomato, chipotle, cumin and water. Bring the mixture to a boil, then turn down the heat, and simmer for an hour, then add salt to taste. Cook for another hour or until the beans are tender. Retrieve the chipotle peppers from the pot. Mince either 1 or 2 and return them to the beans. Add the coriander and simmer for a few minutes before serving. Adapted from Didi Emmons Vegetarian Planet. Those are some great pictures. Chipolte peppers and black beans sounds great too! I love snow, but not so much the cold weather. Great pics! 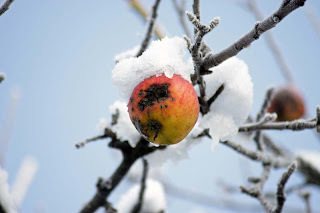 I like snow, but this snow is not very romantic. Its been rather disruptive and dangerous at times - the roads and pavements are really icy and skiddy. I also wanted to say a heartfelt Thank you for choosing to becoem a follower of my blog. I am humbled. Thank you. This sounds perfect to fill your tummy in the cold weather, so full of savory goodness. 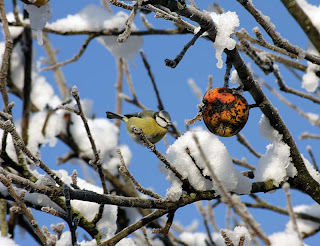 I love the photo of the sweet little bird in the snow. Glad he/she has found something for sustenance. Your comment to Michelle got me looking...I thought I was already a follower, but I found I wasn't...but I am now. I have been reading and loving your blog for quite some months. Thanks for the great photos, writing, and recipes! This does look delicious, even in the sweltering heat we are experiencing in Brisvegas today. I am no lightweight though, I can eat a hearty winter feast in the middle of summer. Such a kind and lovely comment/compliment. The combination of beans and chillis is one I love too. I recently bought a load of chipotles on a trip to Canada, and I am planning to use them with my home-grown borlotto beans to make a dish that sounds very similar to the one you made. I find chipotles quite hard to find in the UK. Where do you get yours? First let me say, I am so envious of your borlotto beans. Its something I'd love to grow one day, not ony to eat, but to marvel at the beauty.